The 2016 Hugo Awards for science fiction had their ceremony on 20th August. Last year I closely followed the awards, after reading news stories alleging that US conservatives were trying to keep women authors out of SF. For the sci-fi & fantasy book fans who’ve been following the Hugo Award controversy in the press in recent years, this is a video interview with Sad Puppy 4 organiser Kate Paulk. You may find it illuminating if you read about the ‘sexist Puppies’ – Kate is a woman. Until last year, I believed the Hugo Awards represented the best of SF selected by a popular vote. I now realise that, before the Puppies, < 2,000 people nominated books and stories for the Hugos. Nominating figures are now ~ 3,000 for the most popular categories. 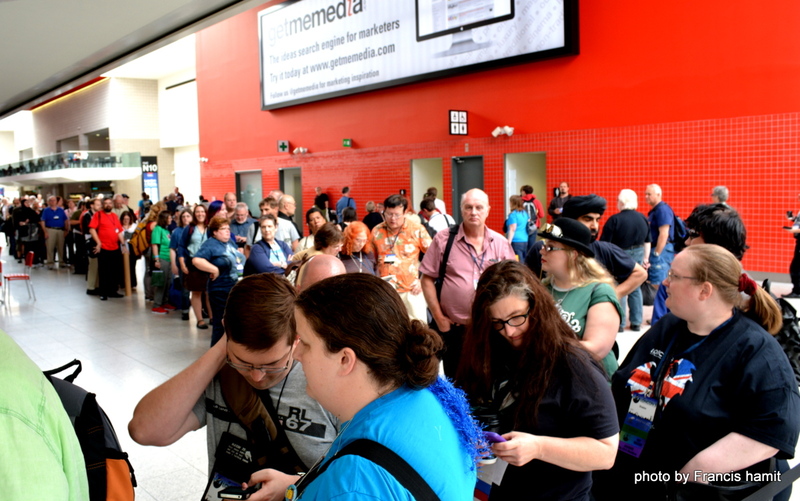 Moreover, Worldcon itself (the convention that owns the Hugos) is a predominantly middle-aged, white, male American convention – I’ve seen the photos [NB: the last picture is taken in London, possibly the most ethnically-diverse city on the planet]. Many of the Puppies who were pilloried in the press for their ‘racism’ last year are more representative of today’s America than the average Worldcon voter. Even the white male Sad Puppy authors, being often ex-military, tend to be (IMO) more likely to be married to black or Hispanic women – sometimes from outside the US. The ‘real’ controversy over the Hugos, contrary to what’s being reported, started as a clash between (often) self-published pulp authors from middle America and the New York literary set. Many of the former group were commercially-minded Republicans/Libertarians, writing for an US market, who have little interest in ‘literary’ or experimental writing. They felt pushed out of awards by an influx of short story writers with literary backgrounds and a (perceived) intellectual metropolitan outlook, whose work doesn’t have the mainstream appeal of – say – Twilight. Last year, the situation was complicated by Rabid Puppies, a coordinated voting effort by readers of alt-right blogger Vox Day. So few people nominate and vote in the Hugos that a single blogger can sweep entire categories. Vox Day is, as widely claimed online, a racist and white nationalist. He’s also a geeky computer game designer with a similar taste in fiction to me whose small press Castalia House is publishing writers rendered mainstream unpublishable by their attitudes/views. Were he alive today, these would include H.P. Lovecraft, creator of the Cthulhu mythos, whose racism was extreme even for the time, but whose imagination and influence are unarguable. In short, don’t believe everything you read in the media. Journalists don’t have much time to research these days, US politics is increasingly tribal, and the New York literary set have a good PR operation. I like Paolo Bacialupi too (click for my favourite short story)! I don’t think the Hugos are a useful indicator since ‘geek culture’ is now much wider than the voting/nominating pool of Worldcon. They do pick up innovation, but it’s swamped by the groupthink effects of a small community, and swayed by the marketing efforts of big publishers trying to increase sales by scoring an award. The Martian (the book), for example, initially flew over the head of Worldcon fans because it was self-published and became a bestseller via word-of-mouth. The Nebulas strongly echo the Hugos, possibly because the same group of fans use the nominations as a guide on what to read. Moreover, many younger SF&F fans tend to prioritise TV/film/comics/video games over books. Thus, awards given by pure literary conventions like Worldcon tend to be biased by the advancing age of the participants. The Dragon Awards _may_ be worth watching once they’ve got going, but were poorly advertised online this year, and dominated by fans of the authors who already knew about them (so the Puppies). I read and enjoyed the winners, but my taste isn’t everyone’s, as they tend to slant towards pulp thriller and adventure stories. Finally, the Hugos were established in a period when SF was mostly short fiction. The market for short fiction is arguably abysmal – doesn’t pay well, is mostly written by writers for writers, and has a strong slant towards ‘literary’ fiction by former MFA students. Thus, a high percentage of the award categories are for literature ‘no one’ reads. For the moment, it seems that the best way to find enjoyable books is via word-of-mouth from people whose judgement you trust. So blogs, friends, social media, and using Amazon preview to sample books on recommendation lists. As always, this is my opinion as I see it. Some backup sources are in the archives on this website as I did a fair bit of research into the Hugos last year.